BREAKING NEWS – first tomatoes ready in polytunnel and….. we finished our froggy pizza oven and it looks AMAZING! 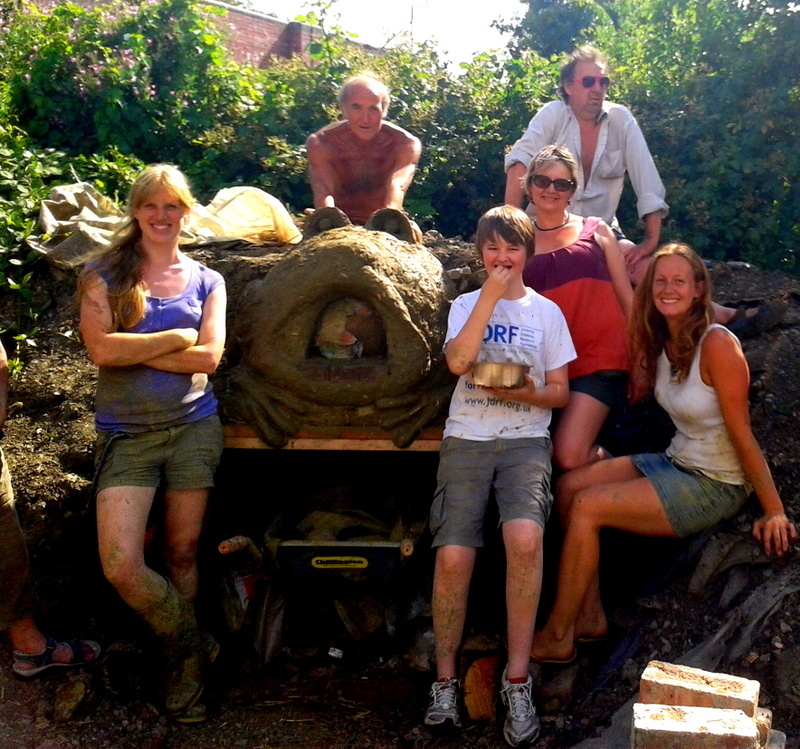 Thank you to everyone who got involved digging, stamping, moulding and sculpting in the sunshine – it was so much fun and we are sooooo happy and proud of the end result. Thanks to the lovely Rachel Baker for guiding us through the process! AND dates for your diary – 7th September we’ll be having a big chutney making day! (Chutney-geddon? Preseverathon? Chutfest? snappy name suggestions welcomed). We’ll be accepting donations of any and all excess produce from veg growers on our site and anywhere – apples, damsons, plums, courgettes, runner beans etc and then spending the day chopping, chin-wagging and cooking down at the kitchen at the community center in St Werburghs.. Anyone who knows a thing or two about chutneys is very welcome as is anyone who ever wanted to learn. You can mooch along for an hour or stay all day. We’ll be selling the results on…. 14th September at our Harvest Fair. Expect all the loveliness of one of our community events now combined with the Horfield and District Allotment Association Summer Show so we’ll have with a competition of best vegetable basket, best scarecrow etc as well as music, cake, facepainting, kids activities and now including 100% more pizzas! The Golden Summer of FUN activity days start next Tuesday and we’ve still got spaces so please let everyone with 7-14 year olds who might be bored/glued to X-box this summer know about it. Me, Claire and Nikki have amassed a war chest of games, crafts, nature fun and general outdoor ace-ness.. I can hardly wait! This entry was posted in News from the Garden on July 22, 2013 by GHCG. Isn’t the weather gorgeous! What better time to come and enjoy the lovely garden, with courgettes bursting out everywhere, lettuce coming out of our ears, chillis turning red as you look at them and everything is growing and growing. This weeks’s harvest included broad beans, garlic, sweetpeas, red cabbage, dill, parsley, beetroot, carrots, baby turnips, chillies, and strawberries. Yum! On Saturday we had a fabulous day starting the pizza oven build, digging clay from the pond, stamping it into cob and generally getting head to toe filthy. We were helped through the whole process by the lovely Rachel Baker. We’ll be finishing up on 20th July so let me know if you want to come and get involved. The current plan is to sculpt it into a big froggy face with the wide mouth to feed uncooked pizzas into and I guess the frog will spit them back out cooked. Again yum! I’m also happy to say we’ve recruited our playwork leader for the Golden Summer of Fun activity days. She’s called Clare and is brimful of experience, imagination and exciting ideas. Me, her and Nikki are going to be transforming the garden into a place of exploration, art, wild fun, outdoor games and laughter. Expect stuff like blindfold nature walks, digging clay from the pond for scultpures, building and decorating shelters to eat freshly cooked pizza in! We’ve started getting children booked on and would LOVE your help promoting it so PLEASE forward the poster on to people with kids age 7-14 and/or print it out and put it up and work if you can. It’s going to be an amazing experience for everyone involved. It’s £25 a session including a delicious lunch but only £100 if you book on all five and we have discounts for siblings! And quick reminder it’s our volunteer meeting next Weds 17th at 1:30 – feel free to come along or let me know if there’s anything you think we should be doing/talking about and I’ll pop it on the agenda. The notes from last one are up on the website. This entry was posted in News from the Garden on July 12, 2013 by GHCG.